Mehmet Dalman is hoping Bluebirds fans can get behind Ole Gunnar Solskjaer and says he wants less talk about non-football issues. 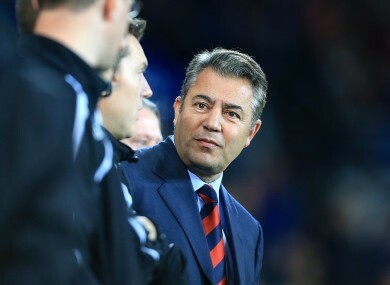 Mehmet Dalman in the stands at Cardiff City Stadium. CARDIFF CITY CHAIRMAN Mehmet Dalman has apologised to Cardiff City fans for recent “non-football noise” and urged them to back Ole Gunnar Solskjaer. Cardiff supporters made no secret of their disapproval at the manner in which owner Vincent Tan treated previous manager Malky Mackay. Tan and Mackay were involved in a public spat that resulted in the Scot being sacked last month, despite guiding the Welsh club into the Premier League for the first time. Solskjaer was confirmed as Mackay’s successor on Thursday and Dalman has taken the opportunity to express his regret over recent events at the Cardiff City Stadium. Dalman is eager to draw a line under the turbulent times of late and concentrate on Cardiff’s battle to stay in the top flight. In a message to the Cardiff faithful, he said: “I hope you’ll forgive us for that and put some trust in us to build this club to what I think it can be built into. Former Manchester United and Norway striker Solskjaer, who has signed a rolling contract, has been assured he will be backed in the transfer market this month and has already briefed Dalman on the players he wants to bring in. Email “'I hope you'll forgive us' - Cardiff chairman apologies to fans”. Feedback on “'I hope you'll forgive us' - Cardiff chairman apologies to fans”.